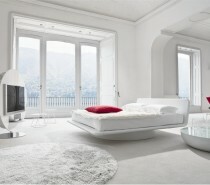 The bedroom is a place to relax, to be pampered, and to be romantic. With the average person spending thirty percent of their life asleep, why not make your bedroom your most important room? 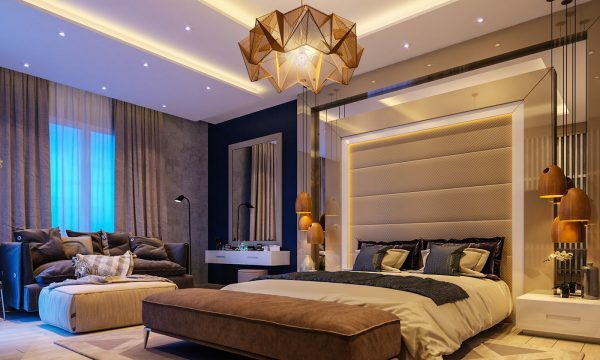 These four luxurious designs, resplendent in furs, satin sheeting, glamorous headboards and beautifully-woven rugs, give a taste of the ornate at bedtime. 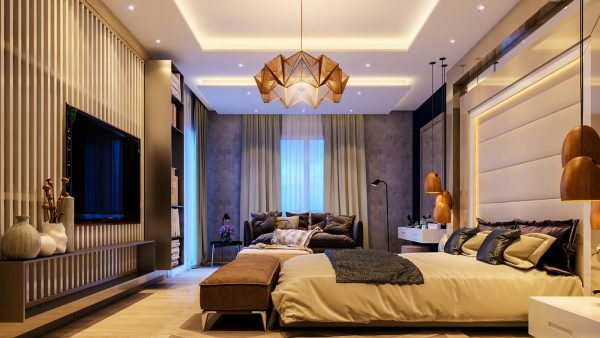 Exploring themes from glowing amber to native African, they show how versatile the bedroom can be – and how glorious a matching ensuite, or pool, can make the space. 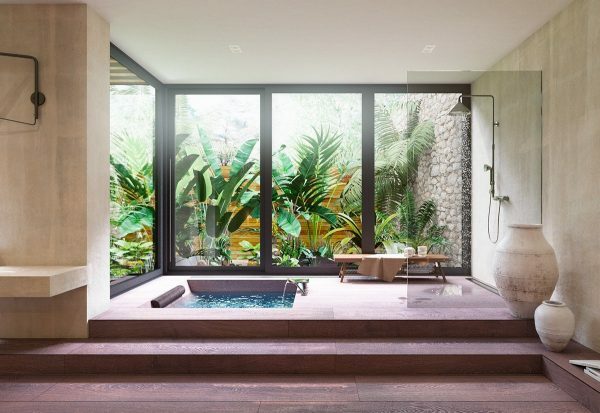 Take a peek at the most private of rooms with these four globally gorgeous designs. 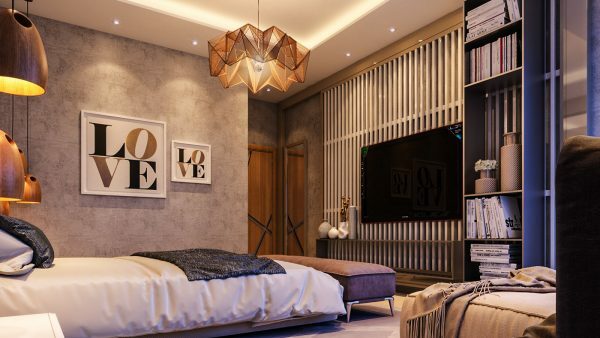 Bedrooms are often for two, and what better way to celebrate it than with warmth and love? 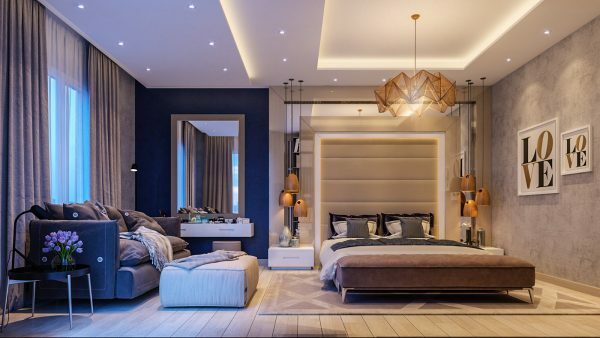 This amber-hued bedroom, eye-catching in tones of brown, grey, beige and midnight blue, knows the way to take romance to the next level. 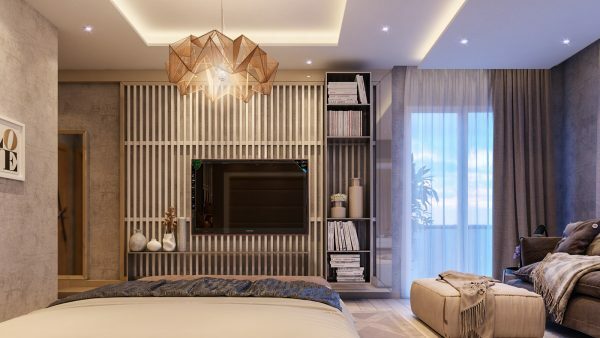 From the front, a textured headboard showcases the bed, while an array of stripes in brown, grey and charcoal clothe it. Smooth walls in midnight blue, and matte walls in light grey, frame each side. 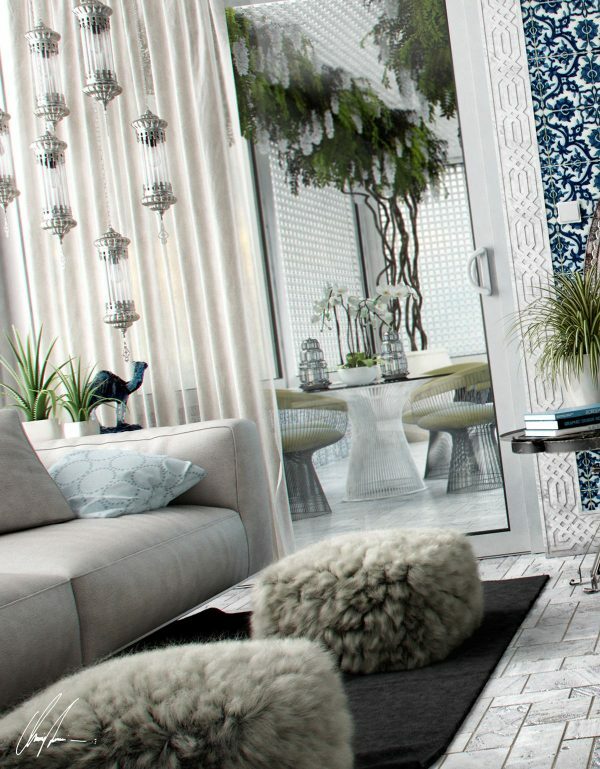 A mirror invites a muted couch and ottoman. Tying to coconut-half hanging lights, an origami chandelier glows above the space. From the bed, a fine wood-panelled feature greets the eye in beige. Above a simple wooden bench, the TV is visited by a row of vases, each emanating an earthy feel. Diagonal to LOVE frames, a bookcase sidles by the feature wall, carrying books bound in white. Grey curtains and white chiffon let light in, while a rustic wooden door seals the deal. 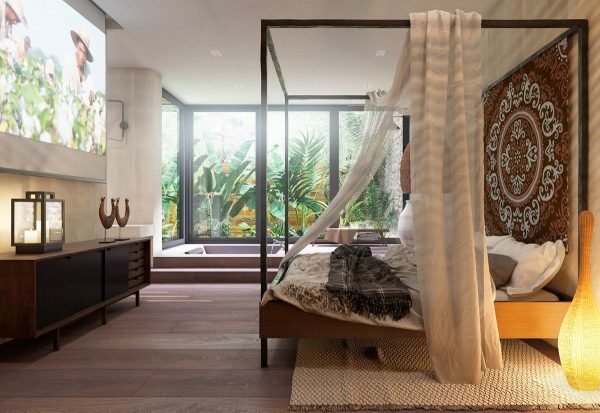 Our second bedroom gives off the tropical and tribal – in one space. 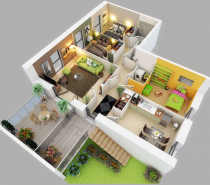 Gloriously open plan, it segments each space through levelling simple wooden flooring. 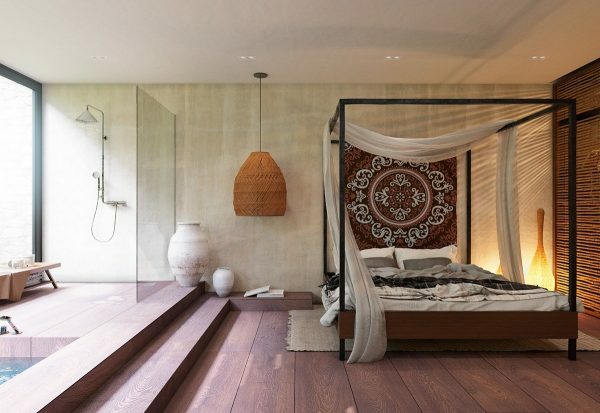 In the bedroom, a four-poster frame makes a statement with a tribal brown and white motif. White calico hangs above, in a manner befitting a king. While lush green palms frolic outside, black stencil framing makes the room modern. A glowing amber lamp, wooden horseshoe and lantern heat up a traditional wooden cabinet. 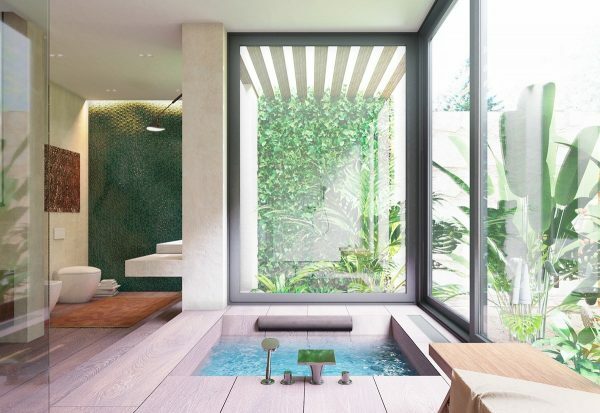 The space steps into a pool area, modernised by chrome fittings. Backgrounded by a cane wall, painted terracotta pots stand to attention and hang from the ceiling. 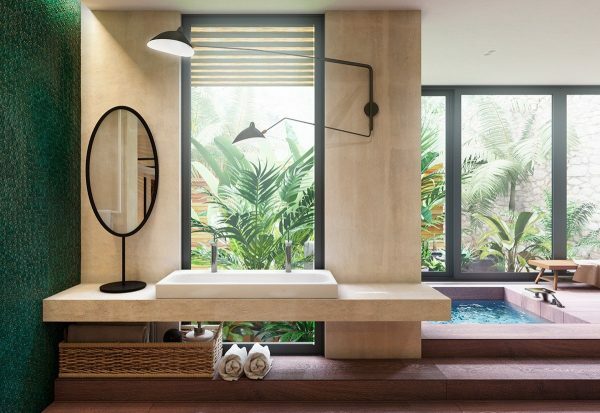 A shower fixture offers a place to refresh, while the toilet invites with a striking jade feature wall. The outdoors play a large part in the design, through large black-framed windows. Looking to the toilet, the green outside mirrors the jade inside. From the toilet, an oval mirror on beige granite appears as another window. A cane basket references the cane wall. 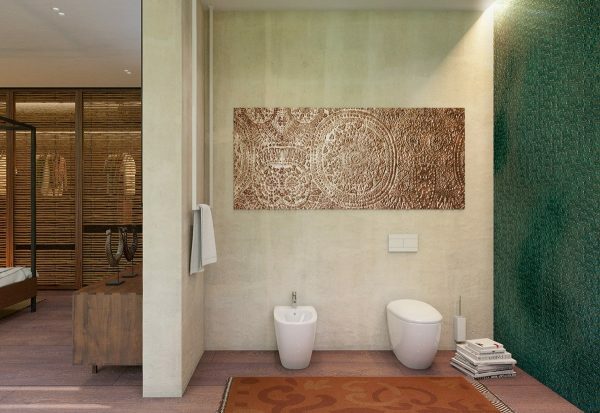 The bathroom closes with a gold engraving, lying flat on the wall. A small porcelain toilet and bide offer simplicity in service. 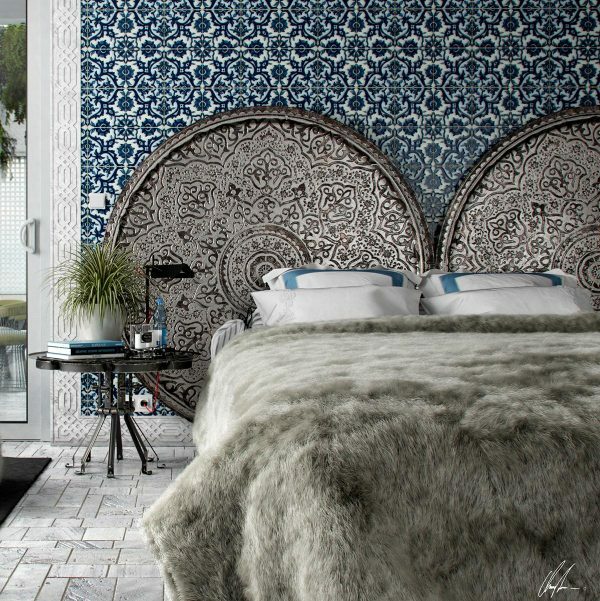 A touch of the exotic is the order of the day for this Tunisian-style bedroom. Taking glamour to a whole new level, this room is fit for a prince – or princess. 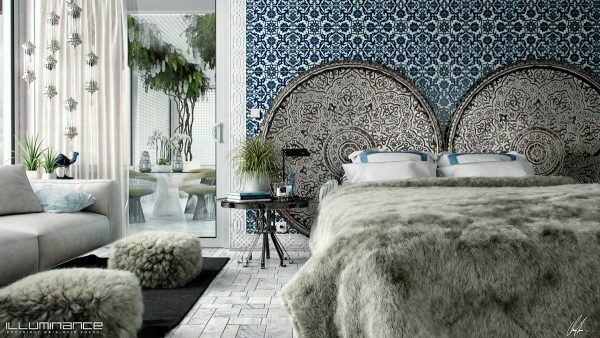 Moroccan-inspired wallpaper catches attention with two silver-etched headboards rolled together into one. 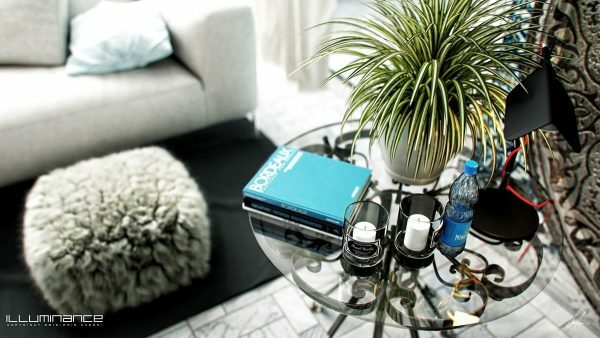 The statement continues with a bed shrouded in grey fur, and topped with blue and white cushions. Reaching out to the side with a mirror, a glass bedside table offers a sprig of life in black filigree steel. Placed on grey stone tiles with a white decorated border, this bedroom was designed to impress. To the left of the bed, a brown leather couch adds masculinity. 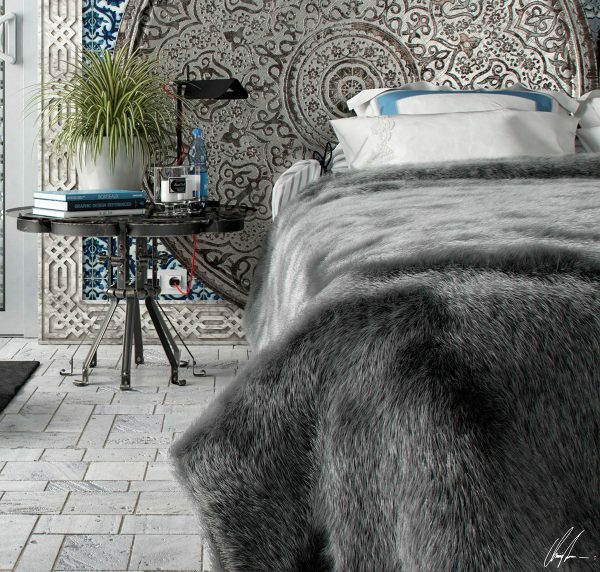 Fur ottomans offer a place to rest the feet, while tying in the fur duvet. A series of silver-and-glass hanging lights and a mirror door frame the view behind. For a touch of the 21st Century, it’s hard to go past this metallic interior. 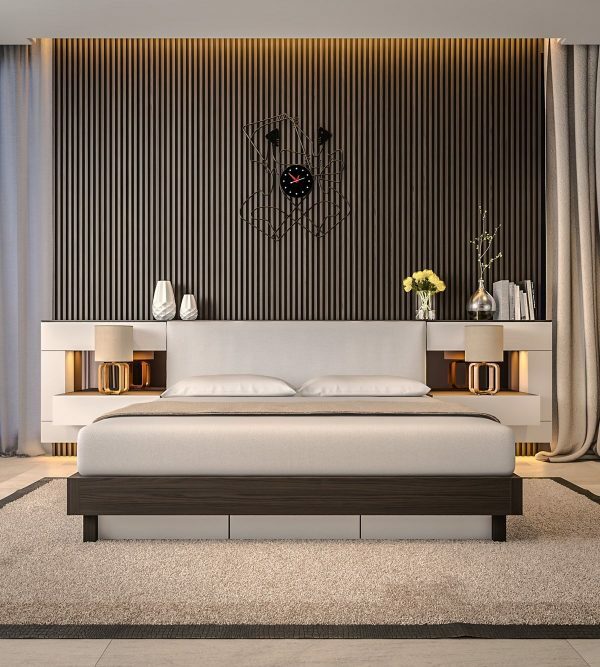 Setting the scene with a silver-and-black lined feature wall, an artful stencil clock traces the time. 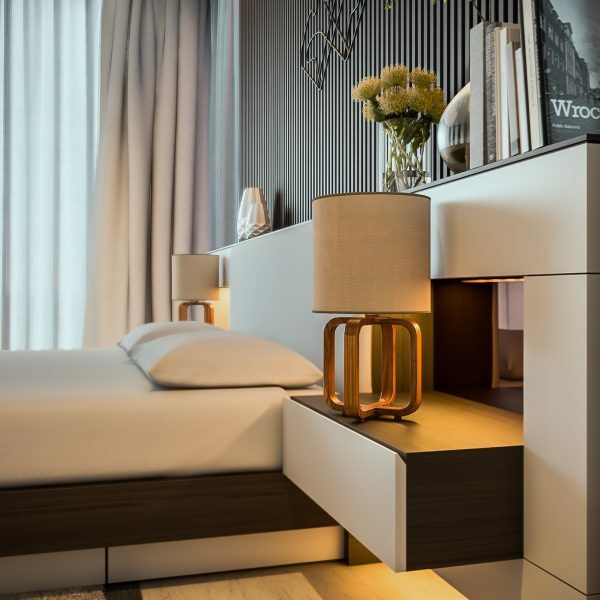 Wide bed panelling in dark wood extends into white enamel bedside tables and a headboard. Trinkets in rose gold, silver and white porcelain are lit by glowing lamps beside. 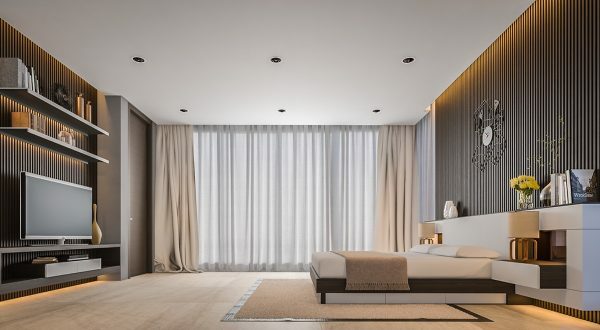 Beige and stone bedding add an air of calm as the TV speaks back on an opposing wall. Shelves hold trinkets high from billowing white and beige curtains. The little details say a lot. Contrasting dark wood and stone enamel play off against rose gold lamps, as books sit above. 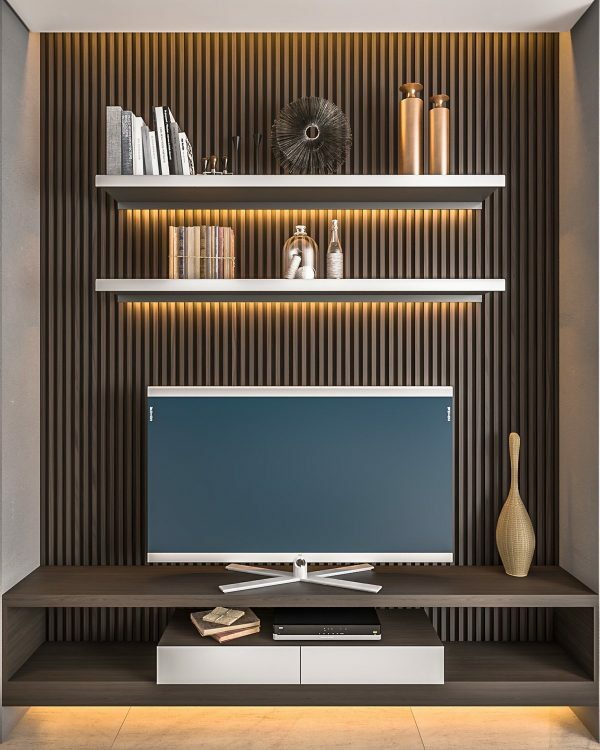 Strip LED lighting underneath shelves lights up metallic accessories, forming an aesthetic line with the top of the TV.